11,000 Views ~ Thank You! 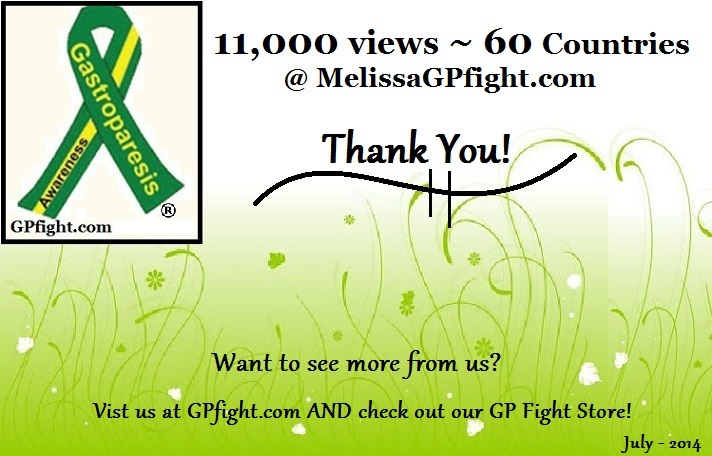 In 13 months we have reached 11,000 people in 60 Countries at MelissaGPfight.com. Even though we haven’t had much time to keep posting articles and information for you, we are happy to know that people keep finding us and coming back for more info. One reason that we haven’t been so attentive to our website is that we have created a second one! You can find it at GPfight.com. This second site will run along side this one, but it will not have the personal blogs that you can find here. It will also be aimed more for a professional look and feel, as we have found out that some medical professionals are giving out our website. The options are limitless (almost), so feel free to take a look and let us know what you may want to see on there. 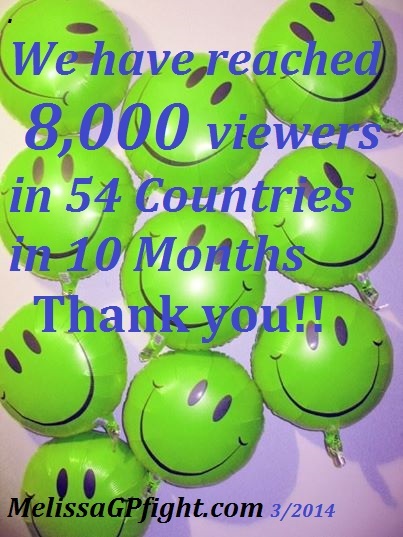 In 1 year we have reached 58 Countries and reached 10,000 viewers! All of this could not have been done without all of your support. You are what drives us to keep going, to keep up the research, to find products that may help all of us and most of all to spread awareness. 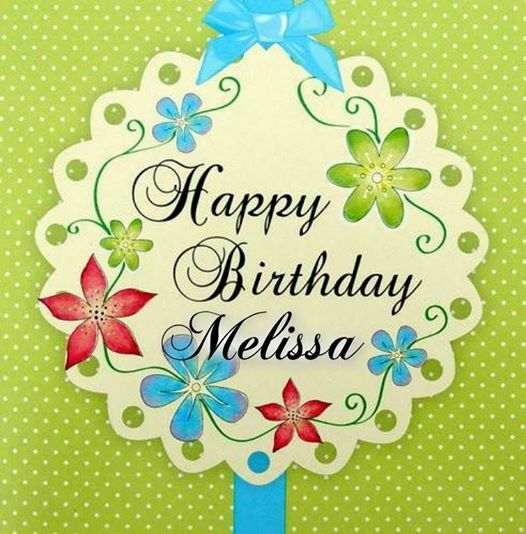 With our year of posts at MelissaGPfight.com coming to an end soon, we are flabbergasted at the amount of support we have received. We will continue to research different topics to bring you articles that you can count on and trust to help give you tips/ideas. Of course we will also toss in a few personal stories, since you enjoying knowing that you are not alone on your journey. As more ‘fighters’ send us THEIR stories we will continue to post them as well under the ‘fighters’ tab. Lastly, when more resources come available we will certainly let you know and add those to the appropriate tab as well. 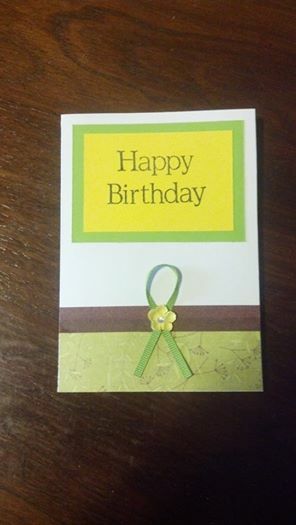 My birthday was on Feb 13th, but I wanted to extend a big hug to all of you for the birthday wishes. Seemed like something was always getting in the way of me doing this post! Better late than never?! 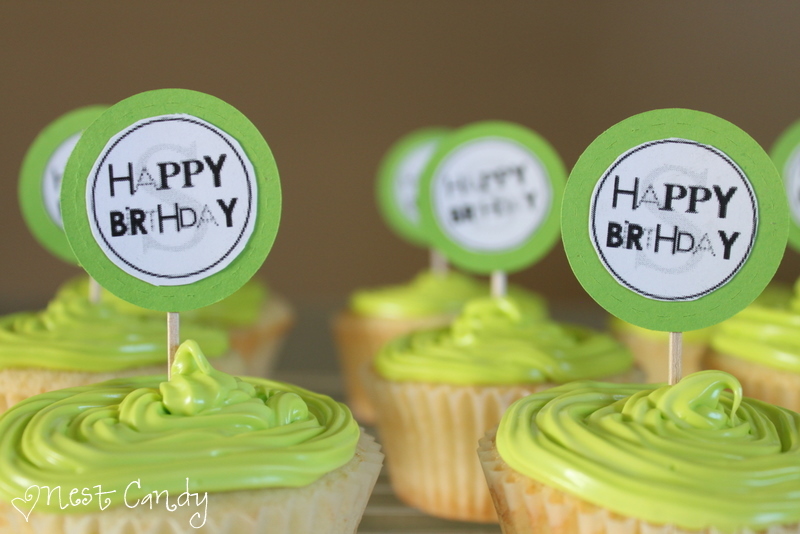 Anyway, for those of you that follow me on Facebook, I had a little over 100 Happy Birthday Messages, some with pictures and a few with videos! I tried my best to respond to each and every one of you. I never dreamed that I would receive so many, you almost had me in tears. 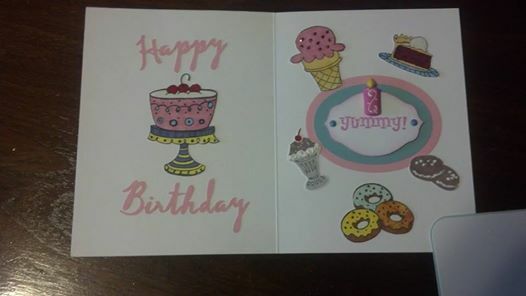 Several of you sent me cards in the mail which were greatly appreciated as well. Even one was of my own creation that I sell on my store http://www.GPfight.bigcartel.com (a 12 pack is less than $1 per card). So a belated round of thanks and hugs for thinking of me. I plan to catch up on my blogging very soon! But first a couple days this week I will be out of town, then a week home before I go on vacation for 2 weeks. I will be blogging about that and taking some pics when I am there. WE can’t have too much GP Awareness!! We’ve reached 8,000 views! It has been a long time since I have posted and I hope to get back to around May. Your continued dedication and spreading the blogs that I write to others is greatly appreciated. Also welcome are the wonderful comments and stories you write to us. We love to know that you have walked away from an article that we write with having learned a little something new. That is what we strive for and aim to help not only the Gastroparesis Community, but an person that can benefit from what we do here. Thank you again! We hope to not keep you waiting too long for a new post from us.